Good afternoon flathead valley! Bergeson RV has officially relocated to our permanent location called 4095 HWY 93 N, Kalispell MT, 59901 As of right now we are 100% open for business and are capable of taking care of almost any of your recreational vehicle needs. We will not have active phone lines for a few more weeks so please contact us using Auston and Donovans cell phone lines(located on our home page) When spring of 2018 arrives we will have our fully equipped service department in full swing and as well as our expanded parts department. Please contact us with any questions or concerns, anyone that is currently in the market for an RV contact us this winter as we are making absolutely unbelievable deals on the campers that are currently in stock to make room for next years inventory that will begin arriving shortly. RV season is here and our units are going out as quickly as we can find them, new as well as used. Get down here quick and see what we have before it is all gone! 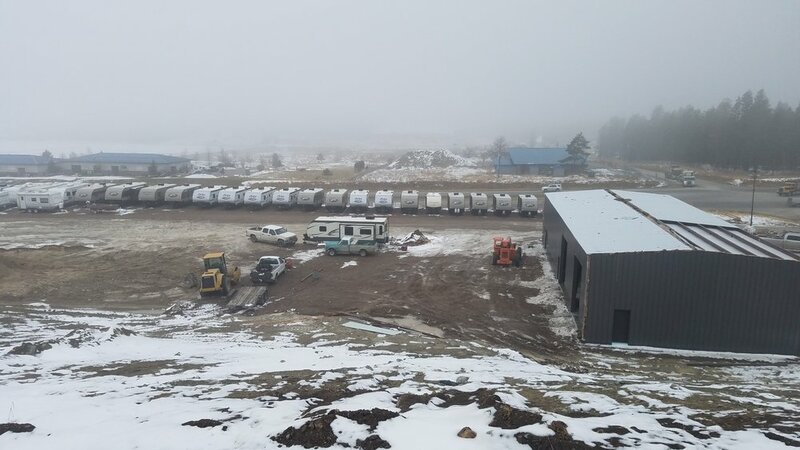 The Grey Wolf factories are sending out new travel trailers as quickly as possible and they are not last long on the lot at all. Currently we have two new Grey Wolfs on the lot along with one new Dutchmen and three new Chateau motor homes. Over the course of the next three weeks we will have seven more Grey Wolf and Wolf Pup travel trailers arriving, one this week and a few each week afterwords, keep checking back with us we will update the inventory as soon as they arrive. The first one to be here will be a 26DBH with two slideouts rather than the single slide model in our current brochure. MONDAY-FRIDAY 8 A.M.- 6 P.M.